The Lynde and Harry Bradley Technology and Trade School is a high school in Milwaukee, Wisconsin. It was founded in 1906 as Boys Technology and Trade School, and changed its name to Milwaukee Trade & Technical High School in 1976, after women were admitted. The school’s name was changed to its present one in 2002 following a donation by Jane Pettit. Local residents refer to it simply as “Tech.” Tech specialzies in Construction, Communications and Manufacturing. Renovations to the school were completed on November 11, 2002. The former Boys Tech building was removed in 2006 using Milwaukee City and MPS funds. The area is currently being converted to an athletic field and park thanks to a grant from the NFL and a local donation. Depending on the outcome of a further funding request to the NFL, the playing field may be changed from grass to artificial turf. Tech has always done exceptionally well in sports especially basketball and football. On many occasions, Tech was named City Champions. Ladies volleyball did an outstanding 2005-2006 season, placing third in the city after Bay View and Riverside. As of 2006, the boys baseball team is undefeated. Girls softball is in fourth place in City. The school has paired with Rufus King High School, another high school in the city, to produce a FIRST robotics team, Team 1675, which attended many events over the last two years. Tech’s long time rival is Bay View High School Red Cats. Tech’s mascot is Tuffy the Trojan sporting purple and white. Eric Benet (singer) and Michael Bennett (NFL) attended Tech. Tech celebrates 100 years. The 2006 graduation ceremony was recorded live for the new channels broadcasting in Milwaukee. The class of 2006 was the first to complete all four years in the new building. Two men stand out above all others in the history of Boys’ Technical High School . One was responsible for the idea of a Trade School, and he fostered that idea until it grew even beyond his dreams. The other was an internationally known figure who made our school exceedingly popular in Milwaukee while giving Tech a national reputation. 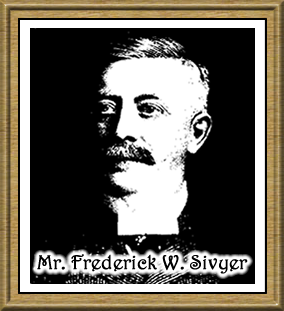 The first man was Mr. Frederick W. Sivyer whose picture is below. As early as 1903, Mr. Sivyer was discussing the idea of a Trade School with other industrialists of the time. As a prominent member of the Merchants and Manufacturers Association, he felt it a duty of his organization to give young men in Milwaukee an opportunity to learn a trade of their choice from skilled, able teachers. In a comparatively short time, students, who otherw ise would probably have become common laborers, could attain a skill and a well-rounded education and enter their field with a degree of confidence and success to the advantage of the individual, of industry, and, above all, of society. It didn’t take Mr. Sivyer long to convince others of the value of a Trade School. But plans had to be worked out. Competent teachers had to be found and hired. A building had to be rented. Finances were a problem. But the Merchants and Manufacturers Association was interested in education then, just as industrialists today sponsor educational enterprises through their Association of commerce, as it is now called. 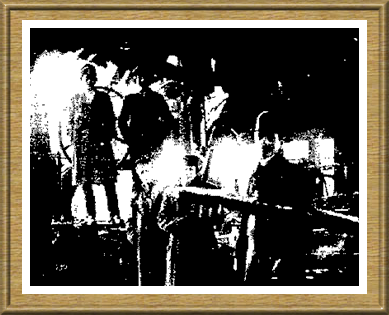 A school of Trades Committee was formed in 1905 with the following influential members: F.S. Sivyer, John I. Beggs , J.W.P. Lombard, Gardner Stickney, O.H. Falk, Louis Auer, A.J. Lindemann , E.G. Pratt, Chas, Quarles, Geo. H.D. Johnson, Carroll G. Pearse , T.L. Smith, Walter Read, H.H. Cutter, J.S. Church, Geo. B. Ferry, A.O. Smith, C.E. McLenegan , and Chas. D. Crane. These members had seen the City Hall grow from the small towered structure. They remembered the old Union Depot while viewing the new impressive depot of their day. They knew that if there was merit in a School of Trades , any centrally located building they could find would grow along with the idea. Henry Harnischfeger of Pawling and Harnischfeger Co. offered just the building to provide a humble beginning. It was located at 156 Clinton Street , now the northeast corner of South First and East Oregon Streets. Mr. Sivyer’s idea was sound; for the School of Trades grew to an enrollment of 2900 pupils, the largest high school in the state. 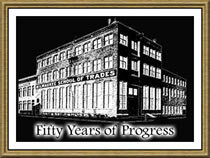 One year after its firm foundation was laid, the School of Trades was taken over by the Education Department of the City of Milwaukee . William L. Pieplow introduced a resolution to that effect to the School Board in 1907. As a member of that board and an advocate of trade education to help Milwaukee grow, Mr. Pieplow has been proud of his part in befriending Tech. William George Bruce, his lifelong friend, who, as Secretary of the Merchants and Manufacturers Association, wrote the minutes from which we gleaned our information, helped Mr. Sivyer immeasurably in sponsoring trade education and Tech in particular, lived only two blocks from Tech until he died in 1949, and was buried from Holy Trinity Church just across the street from our auditorium entrance. Mr. Pieplow chuckles with pride today in his office on National Avenue as he recounts how Mr. Bruce had both eyes on Boys’ Tech as he watched industry and Milwaukee expand. Their picture was taken as they spoke at our graduation exercises in 1946. What was there in the beginning of Tech that appealed to the civic leaders, industrialists, students, and the public so much that our school grew into national prominence? The Artisan Staff has found three things that attracted young men to Tech beside the genuine heartfelt support of Milwaukee ‘s leaders. One was the very promising course of study; another was the popular support of the city’s School Board; and last was the sincere boost given to Tech when the internationally famous speaker mentioned above convinced Milwaukee that Tech was a symbol of America ‘s progress in the production field. In our first building, the Machine Shop was on the first floor, a Cabinet Shop in the second, Pattern Shop on the third, and Plumbing in the basement and rear of the left wing with a warehouse or storage space in the right wing. Offices wee on the main floor of the left wing, and Drafting was taught on the second floor. The first instructors were completely qualified to teach. They were selected from industry by capable personnel men. The cost for attendance was at a minimum for, as a 1905 Prospectus says, “It is not expected that the fees received will pay the expenses of operation, but the deficit will be made good by public spirited citizens who feel the need of such a school and appreciate the benefit to the city and its growth which will result from its maintenance.” Students were expected to have actual practice but “learn the reason why” in all courses. In this yearbook, the aims of all courses are written into the shop sections; Courses allied to the shops were Drawing and Mathematics just as they are today. Present day students merely add requirements for a high school diploma. After only one year of successful operation, the Milwaukee School Board saw the great value of a Trade School in the overall picture of a growing industrial city and decided to take over the administration of the enterprise. On July 1, 1907, Tech became part of the Public School System. But the trades were something new in schools. Trades had been learned by apprenticeships or from fathers or by trial and error. Probably in the minds of some people trade schools were established with misgivings. But by September 8, 1910 all doubts were dispelled, and Milwaukee was proud to be in the national picture educationally. Former President Theodore Roosevelt was on a goodwill tour of the nation. An entourage of newspaper men from all the leading cities in the country followed him and wrote up every word he said to be thought over by an eager reading public. In Milwaukee the whole city turned out to fill the streets on his itinerary. 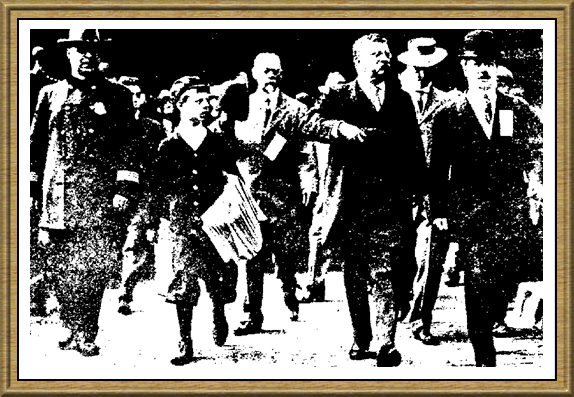 The picture below reflects his wholesome popularity as he stepped off the train to be greeted by the mayor and a newsboy on September 7, 1910. Tech was made! And all this despite a fire that burned out the center section of the school on December 31, 1909. The three departments from that section were temporarily moved a block east to the southeast corner of Oregon and Barclay Streets. In the meantime, the School Board got busy on a new building on West Virginia Street . Its progress is shown in pictures below. The two wings were built in 1911 and 1912. The wing on Third Street was to be occupied by the Plumbing Shop in the basement and first floor and Cabinet Shops on the second and third floors. The Fourth Street Wing contained the Machine Shop on the first floor, Pattern Shop on the second floor, and Electric Shop and offices on the third. In 1914, the entrance and academic classrooms were built. Scenes here show that addition from the front and the rear. The rear part with the old boiler room was on College Place which is now occupied by an additional wing, barracks, and a new boiler room.